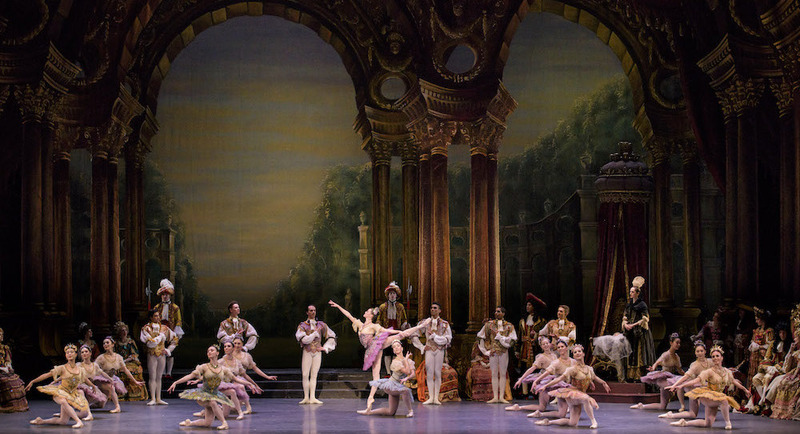 Boston Ballet in Marius Petipa's 'The Sleeping Beauty'. Photo by Liza Voll, courtesy of Boston Ballet. We’re in an age with an enormous amount of content – more podcasts, talk shows, documentaries and “sitcoms” than we could ever consume. At the same time, our money, time and energy – personally, communally and politically – are also stretched to the limit. One might thus come to argue that the classics aren’t the most deserving recipient of our finite personal and societal resources. Why do what was done before, when there is so much more out there to explore? There are, of course, the practical counter-arguments that the classical arts – and not just pop-culture media – build communities, contribute to preventive wellness and dependably create jobs. 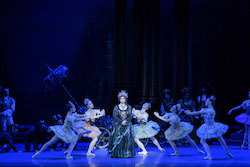 Paulo Arrais, Dusty Button and Misa Kuranaga in Marius Petipa’s ‘The Sleeping Beauty’. Photo by Liza Voll, courtesy of Boston Ballet. Apart from that, classical art can re-create the universal and connect to our sense of collective humanity. It can also powerfully portray the historical; “those who fail to learn the past are doomed to repeat it,” they say. At times, however, classical re-creations are presented with so much glitz and glam that the universal, communal and historical are overshadowed. With masterful discretion and craftsmanship, Boston Ballet’s production of Marius Petipa’s The Sleeping Beauty (running until May 27) offers a magical age-old tale whose wisdom can speak to our mind and heart in 2017. Such effective simplicity begins with a sustained orchestral prologue, a spotlit curtain as the only visual stimulus. It lasts longer than some modern attention spans can accommodate, yet it could in that way be a healthy challenge – to, away from the electronic glow of one’s phone, breathe easy and enjoy the wonderful live music from the orchestra pit. The curtain rises to reveal preliminary character-driven movement, the buzz of activity around a royal court. Set and costumes are immediately eye-catching – elaborate, yet not overly decadent. It all feels historically naturalistic, such as with deep purples and maroons altering the audience to the presence of royals. Erica Cornejo with Boston Ballet in Marius Petipa’s ‘The Sleeping Beauty’. Photo by Liza Voll, courtesy of Boston Ballet. To match that regality, dancers grace us with impressive poise and pride (yet which stopped short of haughty). Certain formations are rich with metaphor and simple beauty, and simultaneously so. A circle of dancers opens to reveal one in its middle, just as does a blossoming flower in springtime. This also happening on the other side of the stage, along with the measured opulence of the overall atmosphere, the stage becomes a bright and joyful garden. Darkness descends over this brightness with the entrance of the commanding Carabosse (Kathleen Breen Combes). Villainy is often best delivered with a hint of comedy, and her creature-like servants provide that. They leap, turn and sink to the ground with grace yet the unique spark of their characters. An intriguing and visually stunning sequence is these characters circling with variations of attitude turns and grounded second position pliés. Touches such as flexed feet distinguish them as truly something set apart from the rest of the characters. Nuanced interactions and subtle interactional qualities is the stuff that can lead audience members to chuckle, and the darkness of their overlady to not too far overshadow the joy created thus far. As modern satirists have shown, we degrade the forces that might lead us to fear and hopelessness through poking holes in their power with jest. Boston Ballet’s comic villains do so without cheese or ham, which can only detract from these characters’ intended and important effect. 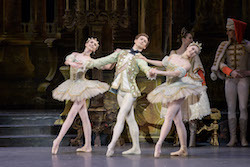 Addie Tapp, Patrick Yocum and Lauren Herfindahl in Marius Petipa’s ‘The Sleeping Beauty’. Photo by Liza Voll, courtesy of Boston Ballet. In the following act, the adolescent Aurora (Lia Cirio) greets suitors seeking her hand in marriage. A movement trend in this act is repetition of specific sequences, well-crafted enough to not become rote. These phrases have elegant simplicity, yet nuance enough to offer viewers something new with each subsequent execution. Aurora extends a leg backward while lowering her torso with a swooning motion at one point, with a similar phrasing but with a turn to clutch a flower from a suitor at another, for instance. Cirio delivers this movement with mastery to the point where her exquisite technique becomes less apparent and meaningful than the joyful aura of this young princess. The universal experience of giddy young love is what can truly connect with broad audiences, offered with grace and ease, more so than technical trickery. In a third act, Prince Desire (Lasha Khozashvili) meets the Lilac Fairy (Anais Chalendard) – this rendition’s “Fairy Godmother”, and responsible for saving Aurora from Carabosse’s curse; her quick thinking and foresight results in Aurora’s pricking of her finger on a spindle leading to a deep sleep, rather than death. Khozashvili’s performance is a standout in a program of outstanding ones. Through extensions and turns in particular, he offers a grounding yet upward lift that can astound and delight. Within those qualities, one can see a regal pride, yet a wonderful heart beneath. This will be the man to fulfill the promise that the Lilac Fairy set forth as part of her saving counter-spell on Aurora; the young princess would sleep for a hundred years to be awakened by a young prince, her spell commanded. As Prince Desire kisses Sleeping Beauty, and she awakes, we know that prince was always to be him. Paulo Arrais and Misa Kuranaga in Marius Petipa’s ‘The Sleeping Beauty’. Photo by Liza Voll, courtesy of Boston Ballet. The third act, dark forces having been overcome, is for joy, love, and light. Forest animals come to celebrate the wedding of Aurora and Prince Desire, and thus fully brighten it. A pair of cats – The White Cat and Puss’n Boots (Diana Albrecht and Paul Craig, respectively) offer something delightfully tongue-in-cheek with animalistic movement such as hip undulations and licking the tops of their “paws”. Blue Bird (John Lam) accomplishes technique spectacular enough to achieve naturalism; rapid-fire footwork, along with an ease of apparently floating arms, truly looks and feels like the hovering flying and hopping to-and-fro of small birds. As exquisitely realistic as it is, there is no “ta-da” with this “flying”, no extraneous calling attention to itself. It simply is the effect that it aims to achieve. That encomposses the quality of Boston Ballet’s Sleeping Beauty overall – a naturalistic portrayal of a timeless story, made universal – and thus relevant and relatable – through that realism. Glitz and glam can please the eye and quicken the heart rate, yet a realism crafted with discretion lives on in our hearts and minds far past when the curtain goes down. The classics sometimes offer us a magical world, but even more powerful is a world of magical quality to which we can aspire. That can certainly be a world of yesterday teaching us volumes about the world of today. The latest talk show or podcast just isn’t quite the same.